Stop by our hobby shop today! Feel like a kid all over again at Mohawk Valley Railroad Co. in Albany, NY today! As soon as you enter our hobby shop, a wave of nostalgia will wash over you as you take in the sights and sounds of our model trains. Mohawk Valley Railroad Co. is a world of its own motivated by the passion we have for trains. No matter if you're a lifelong enthusiast or someone on the hunt for a new hobby, our hobby shop is the place to go. Mohawk Valley Railroad Co. is conveniently located in Schenectady, N.Y., near Albany, NY. We are easy to find for our customers across the Capital Region who return time and time again to enjoy our hobby shop. When you step inside, you will find more than 3,500 square-feet of space that we like to call our train and hobby haven. The only thing larger than our store is our enthusiasm! We’re a one-of-a-kind, full-service hobby shop, which means if you’re looking for anything related to model trains, we either stock it, know about it or can get easily get it for you. We also carry Lionel trains! We have a vast selection of model trains! Our staff is uniquely passionate about trains. They'll be overjoyed to share their knowledge and enthusiasm with you. We sell just about every model train product you can imagine. On top of that, we love to collect, fix, buy, build, repair and teach about trains. We love speaking to customers, be they new to the hobby or old pros, about Lionel trains and all the other brands that we carry, including Atlas, Revell and Rail King. As a full hobby shop, we also offer a wide variety of items aside from model trains. Looking for Estes Rockets? We have rockets and supplies in all sizes so that you can enjoy all the fun that rocketry has to offer. Need to build the perfect Pinewood Derby car? We have everything you need at Mohawk Valley. Looking for Dragon model kits so that you can get creative? Stop by for a great selection and a great price. Whatever your hobby or craft might be, Mohawk Valley is the place to go for your supplies! Our extensive line of top brands is supported by the most knowledgeable staff around. We specialize in estate and private collections, so come see us for appraisals or any questions you have about the value, age or condition of older model trains. We’ll always give you an honest appraisal that won’t cost you a penny. At Mohawk Valley Railroad Co., we have many hard to find parts and components right on our shelves. If you don’t find it here, we’ll know where to get it for you. We specialize in all aspects of model trains, and carry the premium brand of Lionel trains. Come visit us at Mohawk Valley Railroad Co. in Albany, NY today to experience the unparalleled joy of model trains! At Mohawk Valley Railroad Co., you'll find heaven on earth for model train enthusiasts! 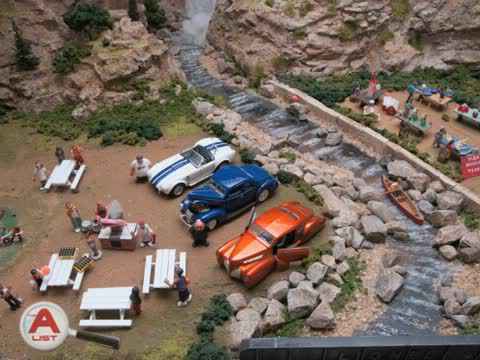 Our model train store is the biggest model train dealer within a 200 mile radius. We have it all, from the top-of-the-line to the hard to find, from hobby supplies to model helicopters. We buy and sell estate collections, so our selection is always changing. When you pay our Albany, NY location a visit, you'll be drawing on over three decades of model train knowledge and experience. We do on-site repairs. If you're a hobby enthusiast like we are, and you're looking for competitive pricing on top brands like Lionel trains, there's nowhere better than Mohawk Valley Railroad Co.!